Human Resources is an essential arm of any company in the 21st century–but its place, purpose, and future have never been more uncertain. In this anthology, we consider what lies ahead in the evolution of Human Resources: how it will need to grow and change to succeed, but also, what we must do as professionals, practitioners, and experts to drive that evolution. Authors include: Angela Bailey, Whitney Bishop, Teresa Cofield, Karen Dahlem, Michele Fantt Harris, Paula Harvey, Dawn Holzer, Eric Huber, Olivet Jones, Whitney Martin, Robert Price, Sandy Ringer, Linda Smith, Cassandra Tembo, Trasee Whitaker, Patricia Keene Williams, Lisa Withers. 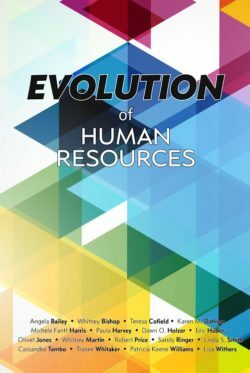 To order your copy of Evolution of Human Resources (all Amazon sales benefit the SHRM Foundation), click here.